When you see a new patient in your office, or a patient who is returning after a long absence, it’s important to conduct a thorough exam to establish a baseline for their oral health. A comprehensive oral exam will provide you with the information you need to put together a treatment plan that will address the needs of your patient. Documenting a patient’s existing work and diagnosing the conditions that they have is considered best practice, and will improve overall patient care. 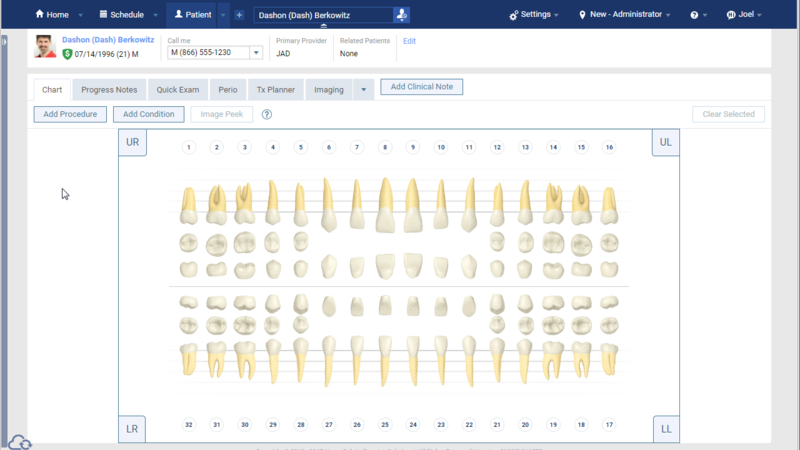 The Dentrix Ascend Quick Exam clinical module is an efficient way to record the many data points in a full oral exam. The ability to post newly completed procedures does not exist in Quick Exam, because the workflow is for conducting an examination. Use the normal Chart to post completed work and to view the graphical symbols that are posted with procedures and conditions. The entries in the Existing Work and Treatment Plan columns are populated from your procedure code Favorites list and are sorted by ADA code. You can plan multiple treatment options, for example amalgam or resin composite fillings, for any given tooth or range of teeth. Just click the different options while the tooth or teeth are selected. Use the Treatment Planner to later organize them into cases. When the tooth you select has history from a past exam, the conditions, existing work, or treatment plan appear at the top of the column list with the date that they were recorded. This is to help you avoid duplication. The color coding in Quick Exam corresponds to the same colors you see in the main tooth chart: light blue for existing work, dark pink for treatment planned work, and light green for conditions.